I’ve finished working on some holiday themed paintings. I decided that this was a great time to try out my sparkly paint… it works great on snow. The paint gives a subtle sheen that I think evokes the impression of a sun lit snow covered field. Have you seen a field in sunlight, how is glistens and sparkles? I think it’s one of the most stunning sights in the world. I did a ton of research on different non-denominational holiday symbols and found it exceedingly difficult to do something that I associate with the holidays yet isn’t directly associated with Christmas. For me the holidays is Christmas or to be more accurate, the Christmas spirit. I love the idea of giving and the spirit of generosity that is often associated with Christmas. The odd part of it was that I started thinking about this stuff in..OCTOBER! but I guess that is the life of commercial stuff. My ideas so far have ranged across the board; someone hauling trees, a snowman (finished-see below), and a snowflake. I want to do the snowflake in the puddling style but I’m not sure how it will work. I would really like to do the snowflake with the sparkly paints… cause that is way more fun, but they don’t seem to flow as well as the regular watercolors, which means using them in a puddle isn’t the best idea. so… I have the snowman completed. Oh and I added a Season’s Greeting’s to it. Let me know if you like it. You may be able to see here how I used the puddling technique and the area below is all flowey. 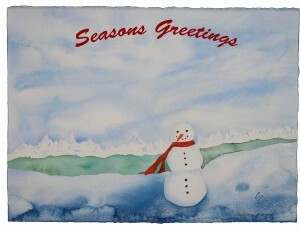 I like this piece but don’t love it… I think the snowman is a bit awkward and I’d like to redo the foreground. That being said, I think it’ll look great on a card… and that’s why I painted the piece. 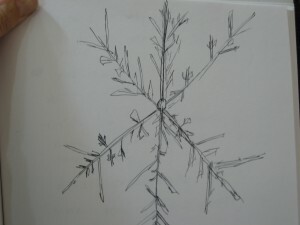 the next piece will be based on the below sketch… A snowflake. 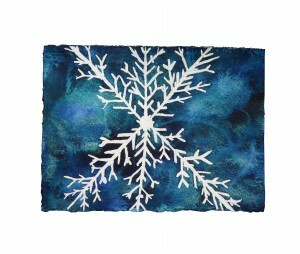 I’m going to use resist to protect the snowflake design and then paint a puddled passionate background. Maybe in a green? Or maybe I’ll do a red background with a green snowflake. I would like to keep the colors contrasting yet christmasy. I think that the combo will make for a fun card. The trick is to keep the design simple enough that it will reduce in size for printing very well. I finished the painting, let me know what you think! Off to create some cards!